Faith Auto Glass & Tinting provides fully customized, expert window tinting in Riverside County. We sell and install factory-tinted glass as well as apply superior-quality tinting films to existing auto glass. We have successfully supported a wide range of tinting requests, from adding custom tint across a windshield's visor to applying blackout tinting to the rear windows of a limo. We consistently deliver impeccable results, fast turnaround times, and exceptional customer service, which has earned us tens of thousands of satisfied customers and numerous positive reviews on Yelp over the last 25 years. Windshield and window tinting offers a number of benefits: increased privacy; improved visibility; enhanced protection from damaging UV rays; improved comfort as it helps reduce temperatures inside the vehicle; and decreased chance of theft by making it harder for passersby to see valuables left in the car. To maximize these benefits and ensure you get the best results possible, it's important to choose a reputable auto glass company with highly skilled and experienced auto glass technicians, such as Faith Auto Glass & Tinting. We offer superior window tinting for trucks, cars, SUVs, RVs, and boats of all makes and models and can apply tints to windshields, side glass, quarter glass, and rear windows. Additionally, we're knowledgeable about local rules and regulations affecting auto window tinting in Temecula, Hemet, Menifee, Murrieta, Wildomar, Palma, Sun City, Fallbrook, and other cities throughout Riverside County. If you are looking for affordable and professional auto tinting services in or near the Temecula area, give us a call. We provide free estimates and schedule appointments Monday through Saturday, from 8:00 am to 5:00 pm. We can usually complete window tinting on the same day customers come in--often while they wait. We accept cash and all major credit cards. 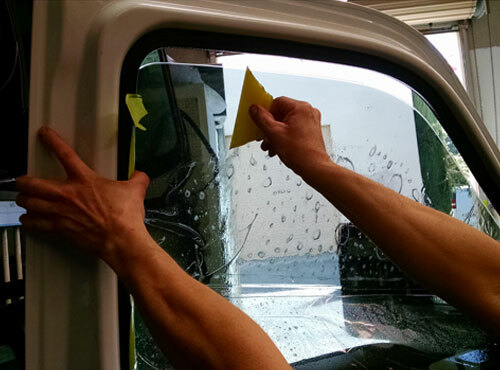 We stand by our auto glass installations with a lifetime labor guarantee. Thank you to Fernando for doing such a beautiful job on my tint. It couldn't have turned out better. It looks amazing! Thank you for the amazing deal. I will forever you give you my services . . .